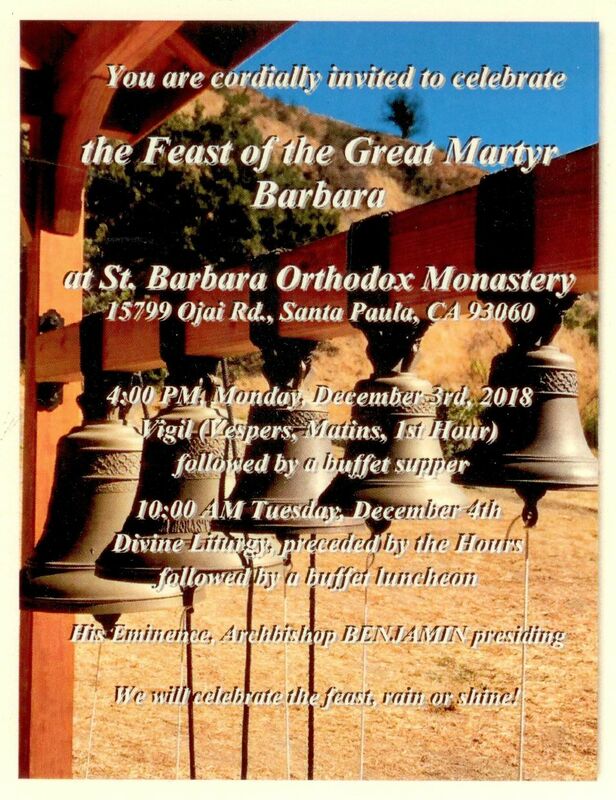 St. Barbara Orthodox Monastery is a women's monastic community of the Diocese of the West of the Orthodox Church in America, under the omophorion of His Eminence, Archbishop BENJAMIN. The Monastery was founded in 1992 and has been located in Santa Paula, California, since late 2005. The Sisters maintain a regular cycle of daily liturgical services and partly earn their living growing lavender and producing lavender products, giving retreats, producing icon greeting cards, and operating a small bookstore and online gift shop where local honey is sold. We strive daily to live out the Gospel of our Lord Jesus Christ in community, seeking to love God and neighbor through prayer, hospitality and labor. ***March 27, 2019 The March edition of the monastery newsletter is available here. Fr Lawrence Russell will give a presentation entitled Humility: The Divine Garment at this Sunday's Friends of the Monastery Gathering. Please bring a lenten dish to share. 4pm presentation, 5pm Vespers, 6pm potluck. ***February 20, 2019 The February Newsletter is now available here. Join us for this month's Friends of the Monastery Gathering this Sunday at 4pm followed by Vespers and a potluck. Fr. John Tomasi will speak about Resurrection and Rehabilitation: Prison Ministry in the 21st Century. Please bring a dish to share at the potluck to follow. Congratulations to our winners and thank you to everyone for participating in this drawing! ***January 23, 2019 The January of the monastery newsletter is now available here. Join us for this Sunday's Friends of the Monastery Gathering featuring the presentation "In the Steps of St. Nikolai" by Archpriest John Finley. At this gathering, we will hold a raffle ticket drawing to announce the winner of the grand prize of paid passage for two people to the September Orthodox Cruise to Alaska. We will also draw for second and third place prizes. Raffle tickets are still available for online purchase here up until noon on Sunday, January 27. Proceeds go to the monastery's building fund. Travel with Fr. Michael Oleksa, expert on Orthodoxy in Alaska, Fr. Laurence Cleenewerck, and ~50 other enthusiastic Orthodox pilgrims. Experience the historic roots of Orthodoxy in North America through first-hand visits to Orthodox historical sites, engaging daily lectures and workshops. Encounter the sheer majesty and grace-filled beauty of God's creation in the Alaskan wilderness. Enjoy the warmth of fellowship with fellow Orthodox travelers. Support the monastery's planned expansion of its living quarters to house additional sisters! 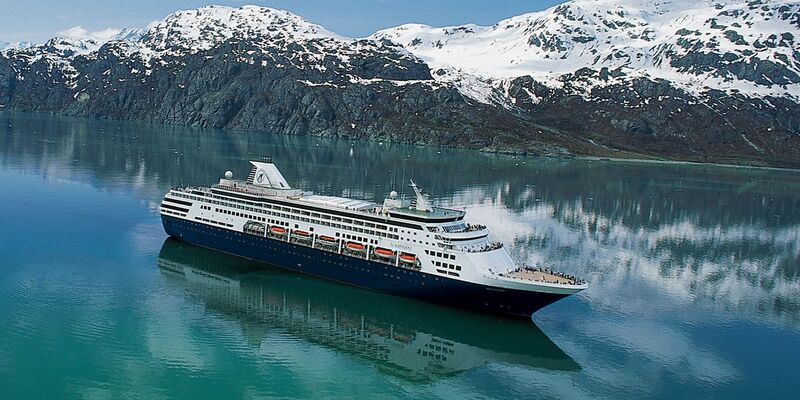 For detailed information on this cruise, visit www.Orthodoxcruises.com. Purchase your raffle tickets by noon on January 27th, 2019 to be entered into the drawing. at the January Friends' Gathering. ***December 22, 2018 Please enjoy our latest monastery newsletter here. We wish you all a blessed Christmas! ***December 13, 2018 Blessed Feast of St. Eugene & his companions! Our monastery chapel is named for St. Eugene. follwed by a buffet luncheon. We will celebrate the feast, rain or shine! View the official invitation here.